The harvest of 2011 was an average year. Planting was late. The summer was wet. 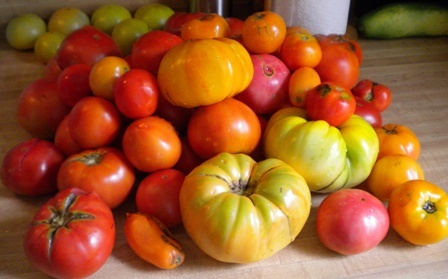 But all in all - still got enough 'maters to harvest and satisfy our tomato usage through the winter. Ended up with ~200 tomato plants in the ground. Salad tomato's started in early July. Quantities started in mid-August and continued through late September. The very 'weak' first Frost enabled us to go 2 weeks into October - a first. So the following pics provide examples of what I do with the bounty. Harvesting is pretty much grab a bag, wander up and down the rows and pick the ripest tomatoes. I've used bushel baskets, old laundry baskets (whoo hoo was that heavy), but the easiest is to re-purpose the common grocery bag. The handles will easily work with 20 lbs or so, or double up the bags for significant quantities of small 'maters (more weight with more volume filled). First bag being prepped for blanching. 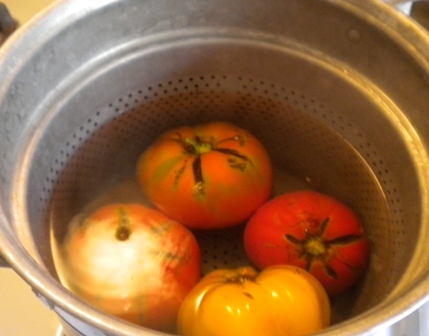 Blanching - the act of quickly heating up the outer skin of the tomato to 'crack it' - so it can be peeled. 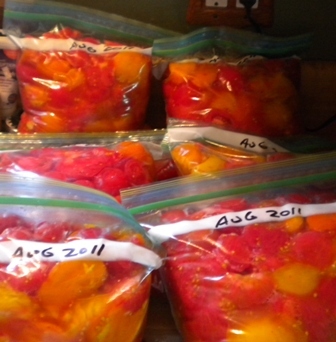 In general, you do not keep the skin on the tomato for canning or freezing. 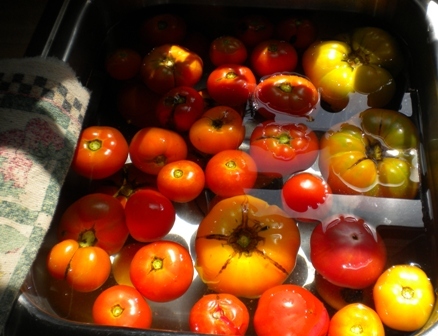 After the quick heat up - you drop the tomatoes into a bath of cool water so they do not continue cooking (e.g. absorbing heat). Do Tomatoes squeal in hot water? Owww it's hot in here! 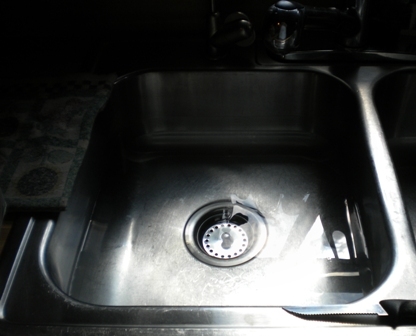 Blanching can be done in hot water or steam. Either way you only want them in the bath for a short time. Enough to cause the skin to crack, which releases it from the outer pulp layers. Hey that's more like it, aaahhh... nice & cool. I usually get a full bag blanched at one time, filling the sink. Then it's time to do the peeling one-by-one - the most tedious part of this work. All told... it takes me about 2-3 hours to do the 4 bags - pick, clean, heat (and keep hot) the water, blanch, de-skin, and bag. The first 6 gallons bagged up, labeled, and ready for trip to freezer. 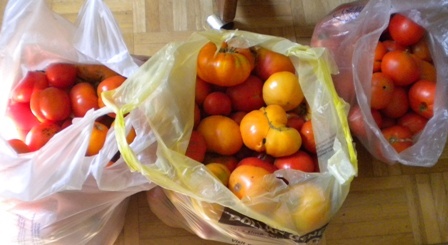 This is what we got from the first couple of shopping bags... so in total - roughly 12ish gallons for the 4 harvested shopping bags, depending on how close I pack them and how each tomato is carved up. This continued about every 4-5 days through mid-September, then tapered off. One load of tomatoes never made it to the freezer... as it went directly into a pot and cooked into chili. Yumm!